Ever since I read Philippa Gregory's novel The Constant Princess, Katherine of Aragon has been one of my most admired historical figures. We all know some parts of the story of Henry the Eighth and his ill-fated six wives: divorced, beheaded, died, divorced, beheaded, survived. But what we also know is that there are a lot of rumours about the time period which make for really interesting but really inaccurate dramas. If anyone has ever seen The Tudors, that would be my case in point. Tudor England was not just a haven of licentiousness and intrigue. It was a highly political time, and also a time when religious belief was much more fervent than it is today. Katherine of Aragon was sent to England to marry Arthur, Prince of Wales, who was the oldest son of the first Tudor King, Henry the VII and Queen Elizabeth of York, who was niece to the king he defeated to gain his crown-- Shakespeare's villain King Richard the third. But not long after Katherine was wed to Arthur, he died of a sickness. Katherine's family then planned to marry her to the second son, Henry, but political tides meant that she faced a long and uncomfortable wait before she could marry this boisterous and passionate prince who would one day be one of the most infamous kings in history. She did eventually marry Henry but their union was not blessed with the sons which were of vital importance to securing the Tudor line. Katherine and Henry had only one living child, a daughter who would become Queen Mary of England-- or Bloody Mary. Henry, thanks to those at the court who would try to influence him, came to believe that the reason his marriage was not to be blessed with sons, was because his marriage to Katherine was offensive to God, citing a line from Leviticus which states that a man who marries his brother's wife will be cursed to have no living heirs. He used this argument as the basis of his campaign to have Katherine put aside so that he could marry Anne Boleyn, and thanks to this process, he founded the Church of England with himself at the head, forcing England into a time of great religious persecution. The history of this period is not little known, but it has been told in a myriad of ways and in varying degrees of truth, if such a thing can ever be uncovered. It was therefore exciting to finally be hearing a version of the story told by historian, Alison Weir, who has written many factual accounts of English history, the Tudor period and the Wars of the Roses that came before it. I enjoyed reading this massive volume immensely, but at times I did feel like the style of the storytelling, particularly in moments of exposition was a little closer to non fiction than to fiction. This was particularly the case at the beginning of the book. By the second part of the story I was racing along, caught up in what I was reading-- it was like revisiting an old friend. Particularly considering so many of the more recent Philippa Gregory novels have not provided me with the excitement those early novels did, it was lovely to discover a new voice to add to this area of history I find so fascinating. This is a long novel, but it needs to be so that you as the reader can get a real sense of how long and how hard Katherine fought to keep her conscience clear. Though she was put aside by Henry the Eighth and ended her days in Kimbolton Castle, virtually in exile, I once read that she continued to make his shirts and to be a loyal wife to him even though he would not acknowledge her as such. Weir makes the comment in her author's note that perhaps Katherine of Aragon is not the kind of feminist figure that we might look up to today, but for her time, she was quite remarkable. As a woman, she had very limited influence over what happened to her, and she did what she could. She looked up to her mother, Isabella of Castile, who was a formidable queen in her own right, and when Henry was in France waging war, it was Katherine who bolstered the forces at home to ward off invading Scots. She was resourceful, loyal and virtuous, and if I were to be having a dinner party with any historical figures alive or dead, she would definitely get an invitation. 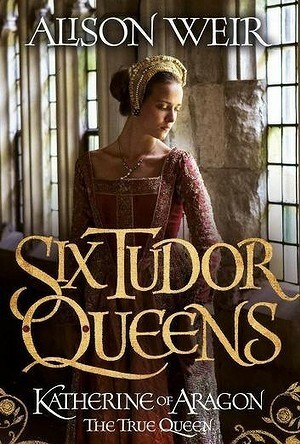 Katherine of Aragon is the subject of Phillipa Gregory's newest novel too, so I am reinvigorated to get my hands on a copy soon and spend more time in the Tudor period. That should tide me over until March next year, when Goodreads tells me the next book in this series will come out, called Anne Boleyn: A King's Obsession.